In the elevator on my way to work last week, one of my coworkers asked me what recipes were coming up on CLK. I started describing this salad, which I made for dinner the night before and packed for lunch that day. When I got to the shrimp and watermelon part, he gave me a look (in a bad way). “I’m sure it’s good,” he said, “But I never thought of that combination.” Another male coworker in the elevator agreed – this sounded like a weird recipe. I was a little taken aback and went on to explain that many other people before me had combined shrimp and watermelon. If I hadn’t already thoroughly enjoyed the salad for dinner, I may have been alarmed by our elevator interaction. The story was entirely different when lunch rolled around and I found myself enjoying this salad with a few female coworkers. They loved it and couldn’t wait to see it here on CLK. It may just be that this one is for the ladies. What do you think? Spray a small saucepan with cooking spray and heat over medium heat. Season ½ pound of shrimp with ½ teaspoon creole seasoning. If you don’t have creole seasoning, try using a seasoning mix with a little kick – or, stick with traditional salt and pepper. When the saucepan is warm, add the shrimp and cook for about 2 minutes on each side until pink. Meanwhile, cut 1.5 cups watermelon into bite-sized (about 1 inch) pieces. I used a melon-baller, which makes the whole process much easier and cleaner, especially when cutting watermelon on the rind. Cut 1 medium cucumber in half lengthwise and remove the seeds. Keeping the skin on, cut into bite sized pieces about the same size as the watermelon. For the dressing, mix the juice of 1 lemon, 2 teaspoons agave nectar (or honey if you don’t have it), and 1 teaspoon olive oil. Toss the cucumber and watermelon with 3 cups mixed greens and 2 tablespoons crumbled feta cheese. Divide onto two plates (or Tupperware – keep reading for storage tips), top with shrimp, drizzle with dressing, sprinkle with salt and pepper, and enjoy! To pack this salad for lunch, put the watermelon on the bottom of your container. It will release some water over the day, so it’s best to keep it on the bottom rather than on top of the greens. On top of the watermelon, add the cucumbers, then the greens, and top it off with the feta. Carry the dressing separately, or get these amazing containers that my roommate brought home! Yield: 2 servings. Per Serving: $6.36, 257 calories, 6g fat, 25g carbs, 29g protein. 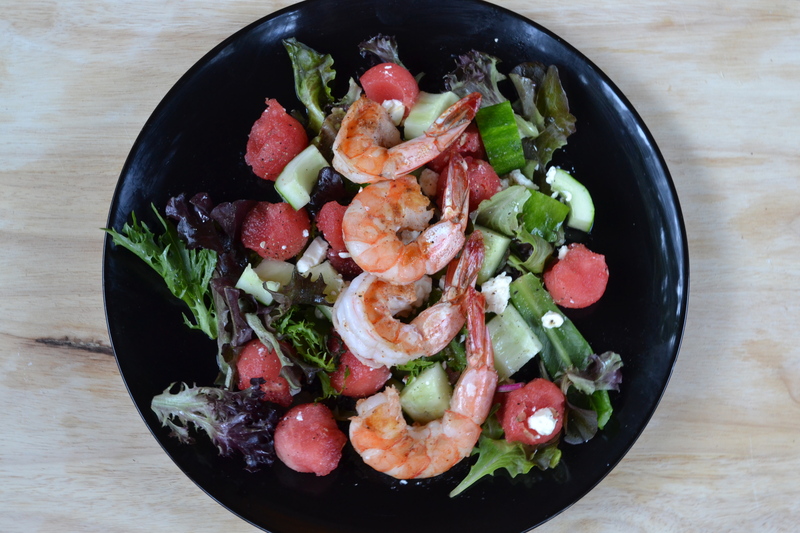 This entry was posted in Salad, Shrimp and tagged cucumber, feta, salad, shrimp, summer, watermelon by cooklikekayla. Bookmark the permalink.